FeedbackFive's product review management software makes it easy to track and manage your ASINs. Get detailed analytics and insight into your products with just a few clicks. Soliciting, tracking and managing product reviews for each of your ASINs is a great way to ensure that your products are performing as expected for your customers. Get automatic alerts for negative reviews and more with FeedbackFive’s product review management feature. Delve into each ASIN with FeedbackFive’s at-a-glance product review analytics to see where improvements can be made. Starting as low as $0.05 per item you track. Available on all FeedbackFive plan levels. *The number of free ASINs varies by FeedbackFive plan level. To learn more about our plans, click here. Want to watch even more? Contact us for larger plans. Set up a customized email campaign in FeedbackFive to automatically send a product review request to buyers. Receive SMS text and email notifications for negative reviews so you can stay informed and respond quickly. Get valuable details about how each of your products are performing on the Amazon marketplace. "FeedbackFive's Product Review Management tool is the best way to track what customers say about our products. It adds value to our company as we are able to track reviews in real time and show our customers how much we care about their opinion." Do I need a FeedbackFive account to track ASINs? Yes, you will need a FeedbackFive account to track product reviews. You can sign up for a free account and simply pay for the ASINs you wish to track. Tracking product reviews is an important part of your Amazon seller reputation management strategy. Product review monitoring can help you ensure that your product quality is meeting customer expectations, provide you with ideas for product improvements or possible bundle items, and provide insight into a product’s lifecycle stage. Monitoring competitor ASINs provide key intelligence to make your products stand out from the crowd. How do product review alerts work? 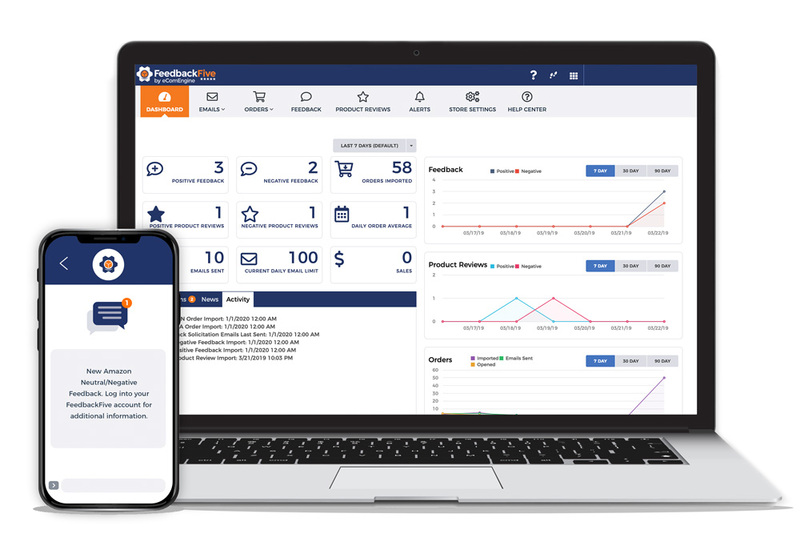 You have the option to receive SMS or email messages for negative product review ratings, which allows you to take action quickly to make things right for the buyer. How do I add ASINs for product review management? Go to the Product Reviews page in your FeedbackFive account and click Add/Remove ASINs. Select items from your catalog or paste ASINS directly into the list on the left. Click save. It’s that easy! The reviews left on those ASINs in the past 90 days will be imported into FeedbackFive. Can I track ASINs that I am not actively selling? Yes. You can track ASINs you are current selling, considering selling or even competitor ASINs.